"Garlic coffee" can be a boon to coffee-loving pregnant women abstaining from it as a man in northeastern Japan invented the drink that looks and tastes like coffee but is made up entirely of locally grown garlic. 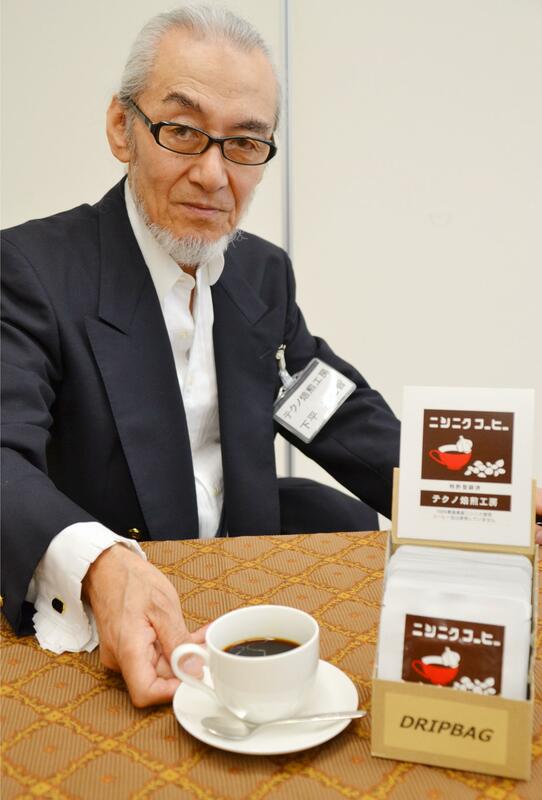 "My drink is probably the world's first of its kind," said 74-year-old Yokitomo Shimotai, who was a coffee shop owner in Aomori Prefecture. "It contains no caffeine so it's good for those who would like to drink coffee at night or pregnant women." Shimotai, who launched the drink's sale in January, said the drink was accidentally made from a cooking blunder about 30 years ago, when he burned a steak and garlic while waiting tables at the same time at his shop. He mashed the scorched garlic with a spoon and mixed it with hot water. When he drank it, he was surprised at its "coffee-like taste" with bitterness. Shimotai began researching the drink after retirement, aimed at turning it into a product. After repeating trials and errors on the optimal way to make it, he created a "coffee" he can be satisfied with about five years ago by using an electric furnace to roast the garlic. After cooling it, the garlic is smashed up and dripped. Shimotai took a patent on the method in 2015, and opened a workshop in neighboring Iwate Prefecture. While his drink has an aroma of roasted garlic, it will not cause bad breath because it is thoroughly grilled, according to Shimotai. The drink is currently available at two souvenir shops in Aomori Prefecture, or by ordering by telephone. A packet containing one cup of garlic coffee for dripping costs 324 yen ($2.8). Orders and inquiries can be made with his workshop called Techno Baisen Kobo at 0195(37)1999 in the city of Ninohe, Iwate Prefecture.